Representatives of ten European Rewilding Network sites came together in March to discuss how social science and raising awareness can achieve better human-wildlife coexistence and mitigate human-wildlife conflict. Beehives damaged by brown bear in Central Apennines rewilding area, Italy. Rewilding Europe regularly organises webinars for the European Rewilding Network (ERN), which now totals 53 members. Here they discuss rewilding-related topics and share knowledge and experience. This year’s first web-based seminar (webinar) took place in March. It included a presentation on two best practice examples from areas in Romania and Slovenia concerning existing conflicts between local people and wildlife. Webinar discussions focused on innovative methods of mitigating human-wildlife conflict, and how to turn such problems into new opportunities for coexistence. Representatives of various rewilding sites across Europe participated in the webinar. They learned about the experiences of two speakers involved in projects that have facilitated a better way forward for both people and wildlife. Mihnea Tanasescu, a post doctorate researcher at Vrije University in Brussels, presented his work studying the attitude of local people in Romania’s Danube Delta rewilding area towards the golden jackal. Before the study many people seemed to have a negative view of the species, which is relatively new in the area. Letea village, Danube Delta rewilding area, Romania. Mihnea wanted to know more about what local people were thinking. He involved the community in the development of his social study, gathering data through informal interviews and wildlife cameras. Data like this can reveal whether there is conflict, and if so, the nature of the conflict and reasons behind it. He then compared two data sets to gain insight into whether they told similar stories. Preliminary results showed that the golden jackal is seen as more of a nuisance, rather than a hugely troublesome species. They also showed that knowledge of the jackal in the community is quite high, and that people are now adapting to its presence. For example, highly pregnant cows were now being kept close to people’s home to protect new born calves from jackal predation. In summation, Mihnea’s study showed that there is not a human-wildlife problem in the rewilding area, but more of a cohabitation issue – both people and the jackal are finding ways to coexist. An important step forward here is to build trust in the community, and help local people to overcome problems. This can tip the perception of jackal from nuisance to pest. To find out more about the progress of Mihnea’s work you can follow his blog. The second speaker was Miha Krofel. A wildlife researcher and assistant professor at the University of Ljubljana, he is involved in the study of several large carnivore species. He is also actively involved in the LIFE SloWolf and LIFE DinAlp Bear Project, member of the ERN. 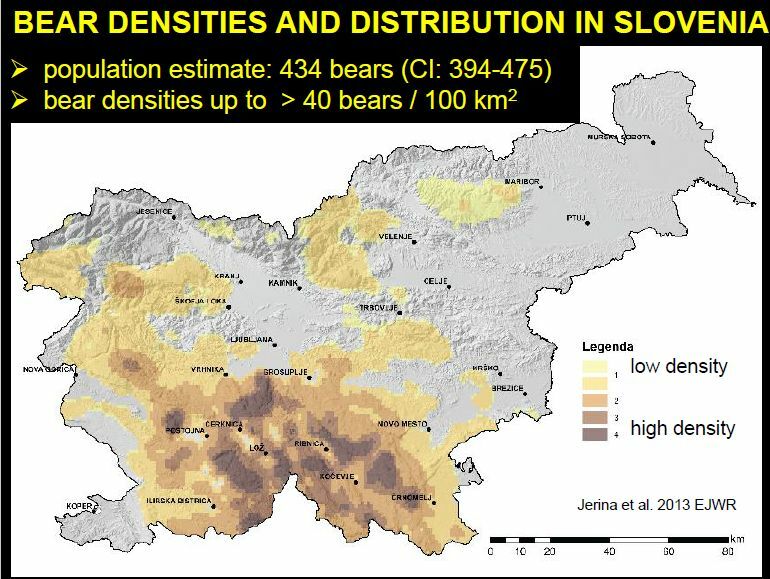 Krofel started by presenting scientific data on the brown bear and wolf distribution and density levels in Slovenia, the level of an annual wolf depredation, and the levels of compensation from 1995 to 2010. He went on to explain how wolf culling is not an effective measure in combatting depredation, and how measures developed by the SloWolf project have reduced wolf depredation by 74% and contributed to the long-term conservation of the wolf in the country. Measures discussed by Krofel included regular inspections, strong collaboration with sheep breeding and dog breeding experts, training on the use of non-lethal protection methods for livestock owners and advisors, intensive work with the media, and methods used to change the public perception of wolves. The summary report with the guidelines for damage prevention and actions to be taken can be found here. 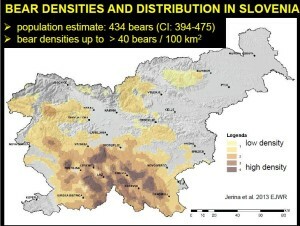 Map showing brown bear densities and distribution in Slovenia. 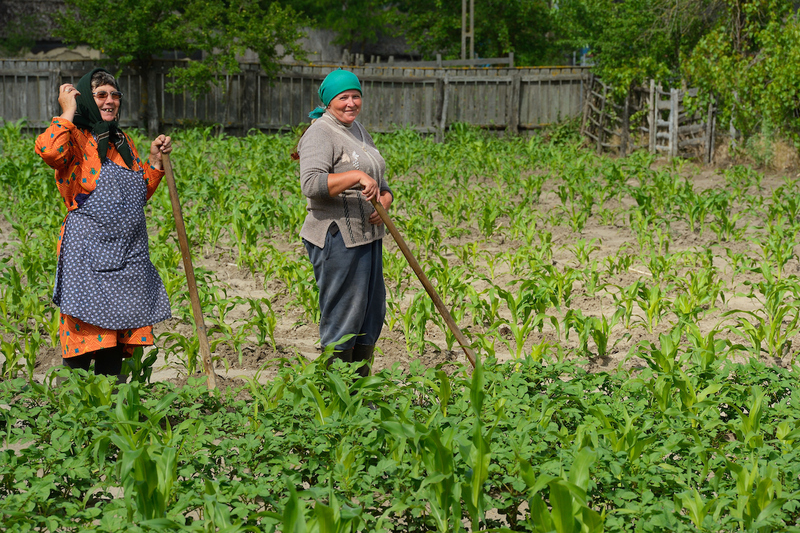 Krofel then spoke about the progress of the LIFE DinAlp Bear Project. 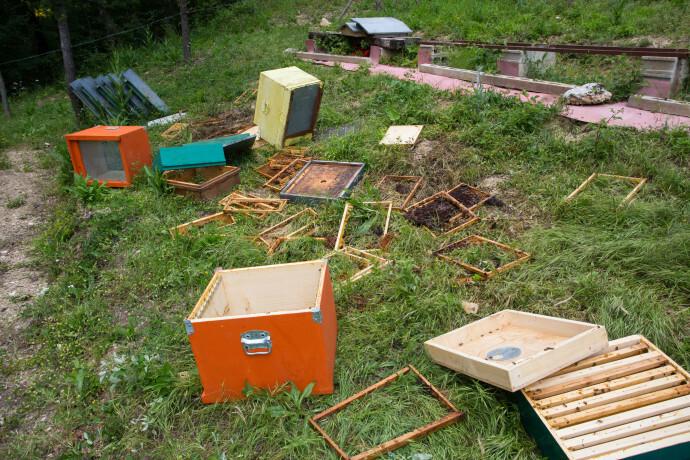 He presented an analysis of human-bear conflict in Slovenia and neighbouring countries, brown bear telemetry, and Slovenian human-bear conflict hotspots. Amongst other positive outcomes, the project has seen the production of a guidebook to human-carnivore conflict, which is available to download here. It offers strategies and practical tips on effective communication and collaboration with communities to address such conflicts. 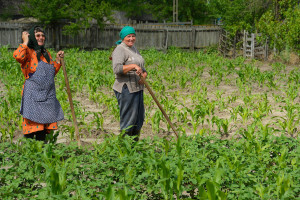 The two successful mitigation approaches presented in this webinar showed a promising way forward in the development of human-wildlife coexistence best practice. During the discussion it became evident that there are similar challenges in other European countries. One of the key points to take away from both presentations is that adopting a preventative and proactive approach is a smart long-term strategy, especially when working with local communities. Such communities are critical stakeholders when it comes to establishing a sustainable method of coexisting with large carnivores. The European Rewilding Network works to share information, knowledge and experience related to restoration and rewilding work across the continent, and stimulate cooperation that helps move rewilding forward. Rewilding Europe encourages all inspiring rewilding initiatives to apply for membership. For more information on how to apply, please see here.